I enjoy a daily morning read each day. It helps set my attitude and tone for the day! I use this app every morning in my program. It is so easy to use and to refer back to during the day. I don't have to carry my book around and I always have my iPhone. Start my day with this and it helps keep me on track! I love this app. So much so that I also gifted one to my mother. The reason I choose the app over the book is because somedays life is so chaotic, I'll forget what I've read in the morning. No matter what happens I always have my phone and can refer to the reading at any time. The readings always resonate with me because I am a true food addict. I am so grateful for this app. It saves me during hectic times and during the good times as well. This app keeps me sane! Literature is one of the tools of OA and these short readings get me started each day in the right frame of mind and give me exactly what I need to hear to maintain my program and my abstinence. On target with a nugget of truth that I can carry with me every day. This app is so helpful. The concepts are right on for food addicts. Always inspirational and helpful! This app helps me tremendously to remember that I am indeed a food addict and that if I want a life of sanity from my compulsion with food, I need to follow a prescribed plan. Each day's readings lift me up, give me strength and hope and help me make it another day. I'd be lost without these readings. Daily motivation before getting out of bed. 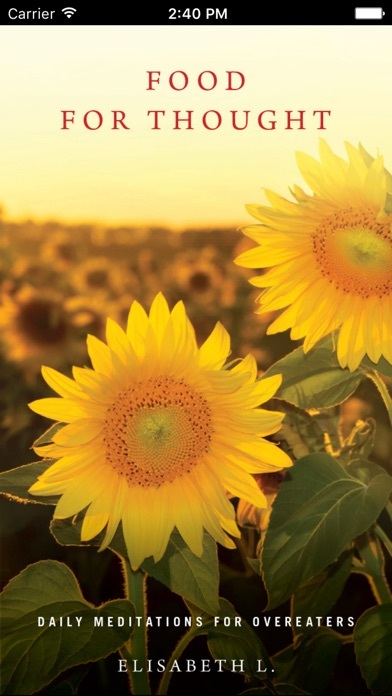 I am a devoted advocate and user of several Hazelden meditation resources and other wonderfull offerings. Generatipns of family & friends are alive and working programs with the help ans support of Hazelden. The only exception, and it is a huge exception, is this totally goofy, stupid & infantile "Food For Thought". The ONE meditation helper is totally without merit. Exceeded my expectations! The daily readings remind me of what is really important. Wonderful app! Perfect for starting my day mindfully. When I'm having weak moments, I grab my phone for words of compassion, serenity and recovery. Wonderful way to be reminded each morning of the wisdom of the program. A wonderful thought each day. I think about the day's message often. Highly recommended! Awesome. 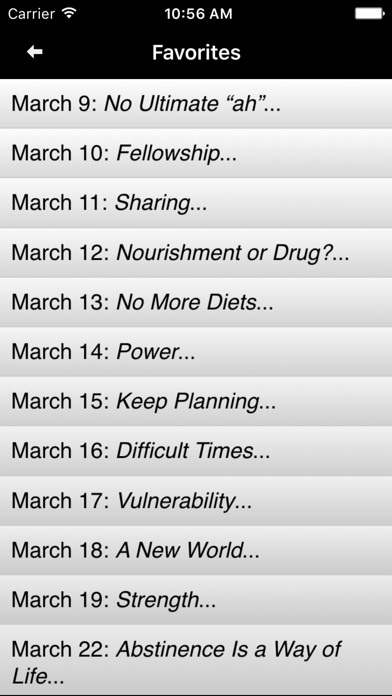 Daily readings help keep me focused on my recovery and to keep food in proper perspective. Food is meant to maintain a healthy body and clarity of mind. It is not meant to escape from life. This book is a gentle reminder of what I need to do for myself to live life on life's terms. I so appreciate the daily meditations that help me stay focused on the truth! Excellent resource for anyone who uses food for anything more than it was intended to be. Highly recommend ! 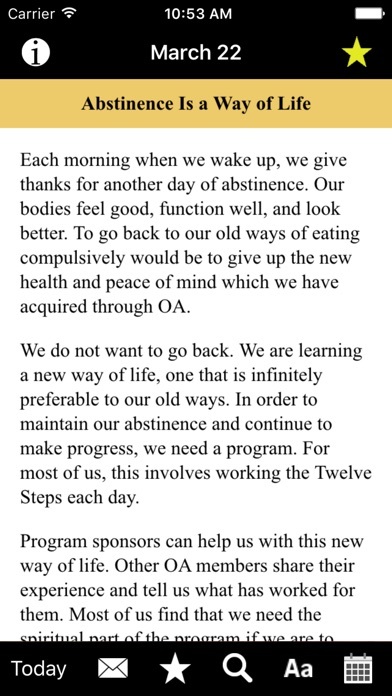 This daily information/inspiration is a great help in staying focused on abstinence. I have read FOOD FOR THOUGHT since the early 1980's, now I'm loving it even more on my smart phone app. I appreciate the thought provoking words of wisdom. I LOVE HAZELDEN LITERATURE!!! This book anchors me in what I know from my 12 step work. Some days I read it over and over again. I recommend it! This book has targeted my food problems for many years It speaks to my obsession with positive alternatives to eating I would highly recommend it for anyone battling the power of sugar! I've had the book for years and the App is perfect when I need to stop and focus. The daily texts speak to my obsession and addiction to food in a way I've never admitted to anyone including myself. I'm grateful to know I'm not alone or a sick person. I enjoy food for thought very much. Glad to have this with me on vacation. Best words of wisdom for each day! Gives me great support and serenity around food and MYSELF! I so appreciate this app. Food For Thought is the perfect reading for Food Addicts. 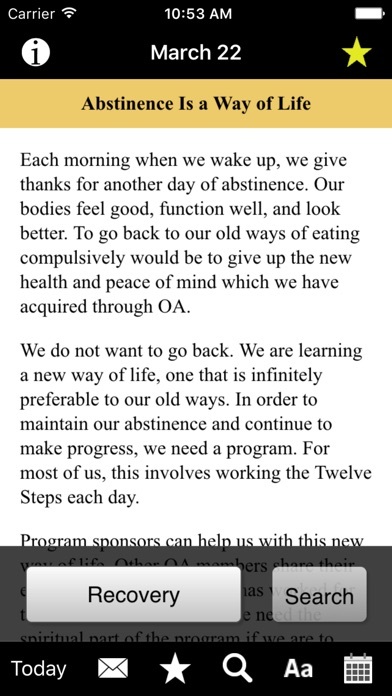 I love being reminded that the 12 Step Program is the answer to our problems. Anyone who struggles with food obsession will relate to these readings. I read my daily reading on my phone before bed. Serene way to a spiritual lullaby. Eileen A. Enjoy the readings. Make me motivated somedays when I don't want to be. Each morning I turn to Food for Thought to start my day. It reminds me why I'm trying to keep my disease in check. Also, God is doing for me what I cannot do for myself! 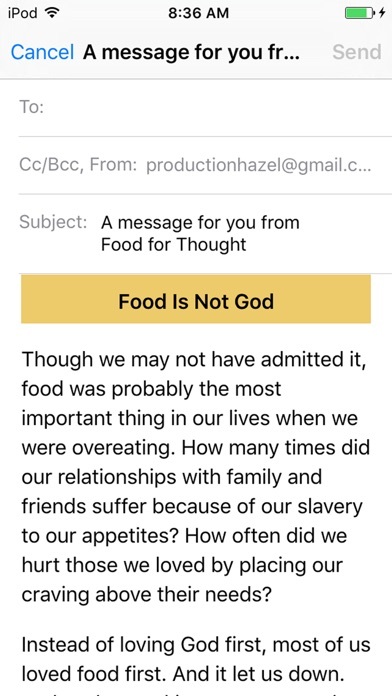 Food For Thought gives me Food for thought. Simple and clear. Just wish it had a built-in alarm or a way to link in with calendar so that it could remind you to read at particular times in the day. That would be awesome! This is my very favorite of all my daily readings on the subject of compulsive eating!